Best of all, it's a BYOB Tour, so it's kinda like a live episode of "Drunk History"! 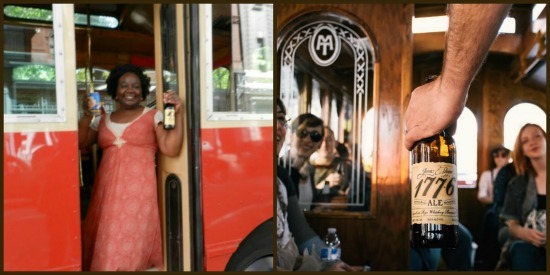 The trolley originates on 3rd & Arch Sts. near Rocket & Fizz. The tour winds a bit through Old City and up to the Art Museum and back. You'd be surprised how much you don't know, even if you're a native Philadelphian like me; plus learning is always more fun when there's wine and beer involved. And don't worry, during the tour there's a stop for a clean and comfortable bathroom break! 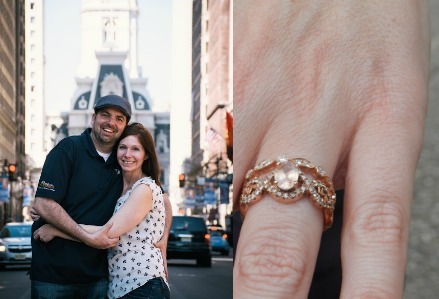 On top of which, Founding Footsteps, a relatively new Historic Tour Company, is run by a great couple, newly weds (coming up on their 1st Anniversary this fall) Tim & Abbie McAleer. Abbie is a warm hostess and Tim has a big personality full of stories and jokes. Fab Sidenote: When Tim went looking for a ring to propose to Abbie, he was heading to Jeweler's Row but found himself in Antique Row, where he discovered Halloween (1329 Pine St, Philadelphia, PA 19107) and famed jewelry designer Henri David, infamous host of The Halloween Ball. I'm always interested in how people get there start up businesses off the ground. So I asked Tim about Founding Footsteps. He's actually a school teacher, who found out that American Trolley Tours was hiring backup tour guides, he signed up and after his first outing realized he wanted to do it full time, but as his own business. What most of us who have a dream like this are missing is that person to act as a mentor; but as luck would have it, Tom, proprietor of American Trolley Tours encouraged Tim's interest and has been instrumental in helping Tim & Abbie with Founding Footsteps from the start. The BYOB Tour is not the only offering. 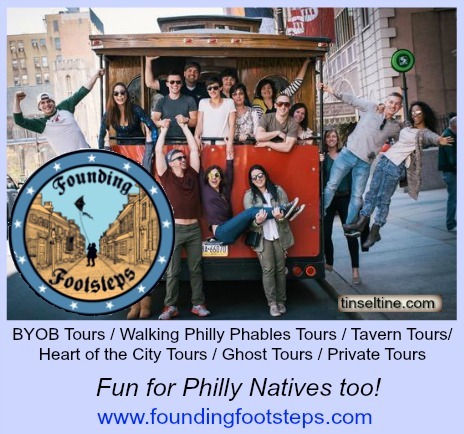 You can also take their Philly Phables Walking Tour or the Tavern Tour, and of course you can book private parties. Your ticket will also give you 10% off at Campos (214 Market St.) Nothing like a Philly Tour while eating a Philly Cheesesteak! Tim & Abbie will also match or beat any Groupon offers, so give them a call before using Groupon. A Fun Time and a Good Cause! Coincidentally, Founding Footsteps runs the Teach 2 the Core program through WesGold Fellows (click for post) which T&T covered in 2014.